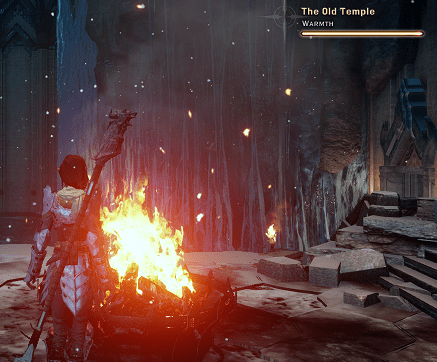 PREVIOUSLY ON INQUISITION DIARIES: I spent a tonne of time exploring the Frostback Basin, the new area unlocked with the Jaws of Hakkon downloadable content. With the help of Lerenne and her team, Professor Kenric has learned that Ameridan, the man who led the first Inquisition 800 years ago, did not simply disappear into obscurity. His departure was at the request of his friend, Emperor of Drakon, to slay a magical dragon controlled by Hakkonite cultists that threatened the kingdom of Orlais. Oh, and we rescued a bear. Nice Storvacker. Please don’t eat me. First up, I decided to heed the game’s subtle warnings and make use of all the sweet, sweet loot and new harvested material this DLC has offered to craft my team some fancy new duds. I was disappointed in having to give up Lerenne’s ancient elven outfit, but luckily, I scored a new schematic for battlemage armour. After a quick hop over to the Hissing Wastes zone to get the matching leg armour, I crafted new cold resistant armour for the whole team. With this extremely important business taken care of, I finished up a few more quests on the map, and headed back to Stone-Bear Hold to enlist the aid of Thane Svarah Sun-Hair for the attack against the Hakkonites in their icy fortress. True to their word, the Stone-Bear clan scale the steep walls to open the gate that Lerenne and her team could not get through earlier, then hold the line at the door with the help of their hold-beast, Storvacker. Hypothermia is not your friend. Inside, the fortress is bitterly cold. So cold, that spending too long away from the fire pits will result in an icy death. This means that I have to plan carefully when moving from one fire pit to another, especially when gathering loot and finding more lore, including journal entries from Gurd Harofsen, the Hakkonite leader. All the while, the voice of Harofsen resonates throughout the keep. He is chanting the ominous words of a ritual that will grant him the power of the demon/spirit Hakkon Wintersbreath, which currently resides within the dragon we know to be trapped in this place. The ritual must be stopped at all costs. We must hurry, warn my companions! This implies that I should forego all the tempting loot that would take me off the heated path. Pfft. I want my shinies. Getting through the big door doesn’t make the Hakkonites happy, and so they attack in swarms, conveniently placed near fire pits. Fortunately, the warmth maintenance is only the responsibility of the character I’m in control of, so this gauntlet, while annoying, isn’t overly difficult, nor is the process of disrupting the mages performing the ritual. Fighting the partially demonized Gurd Harofsen? That’s a bit more challenging. Negotiation is, unfortunately, not an option in this battle. 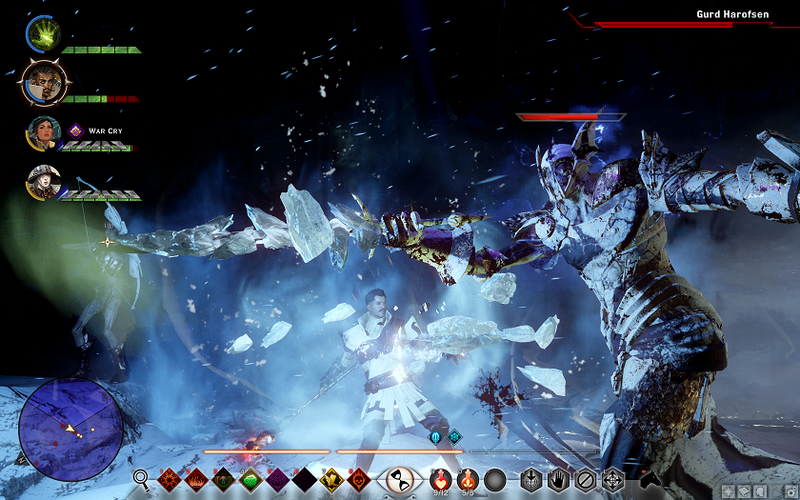 Gurd has many inconvenient ice-based attacks, and is supported by swarms of undead, more Hakkonites, skeleton warriors, and ice wards. He also frequently extinguishes the fire pits scattered around the room. I got down to my last fire pit and my last potion and was starting to worry a bit… but the battle wasn’t really that bad. At least it was more challenging and interesting than the final battle with Corypheus, the enemy of the main storyline. Defeating Gurd reveals the secret we have been searching for: the final resting place Inquisitor Ameridan. Who turns out not only alive, but also a mage and an elf as well. Ooooh how the history books have been doctored. Ameridan looks great for a man who’s been frozen for 800 years, but now we have the unfortunate duty of breaking some very bad news to him. 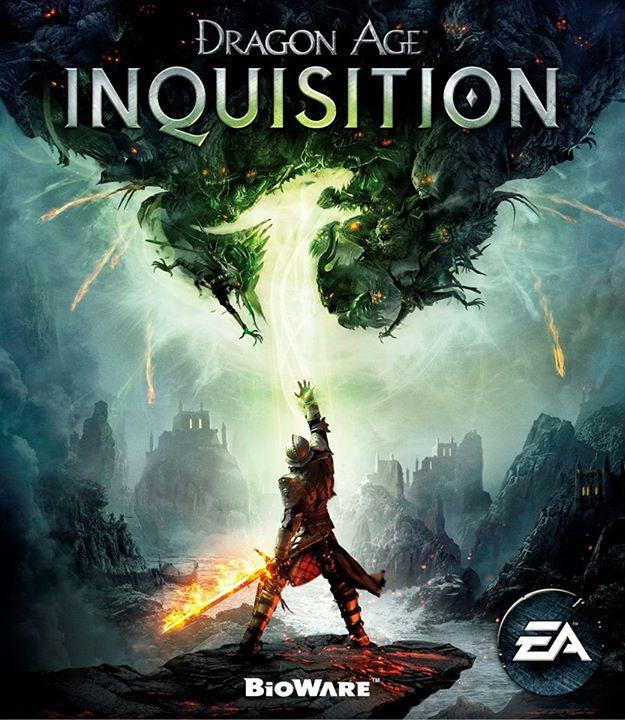 In Ameridan’s time, both elves and mages were respected, if not entirely trusted, and Ameridan, a demonslayer, had been tasked by the Emperor of Orlais to kill this demon possessed dragon, and then return to convince his own people to help Orlais fight the Second Blight that was already ravaging lands to the north. Unable to kill the dragon, Ameridan stayed behind to bind it, and sent his friends, including his lover, Telana, off to warn the emperor. But Telana never made it, and, while Drakon, with the help of mages, fought back the darkspawn, he did so without the aid of the elves, who thought Orlesians to be little better than the Tevinter Imperium. So how are things going, Ameridan asks? I opt to tell him a brief version of the truth: The elves are now a diminished raced, having fallen to the Chantry’s Exalted March. The Dales were destroyed and elves forced to wander in clans, or assimilate into Orlesian culture (read: become mistreated servants and slaves), their immortality lost. Mages whose magic had saved Orlais, had all but been imprisoned in Circle Towers until the recent mage rebellion. Ameridan, the first Inquisitor, represents both of these groups, but because his role in history was erased, mages and elves now struggle against discrimination and fear. 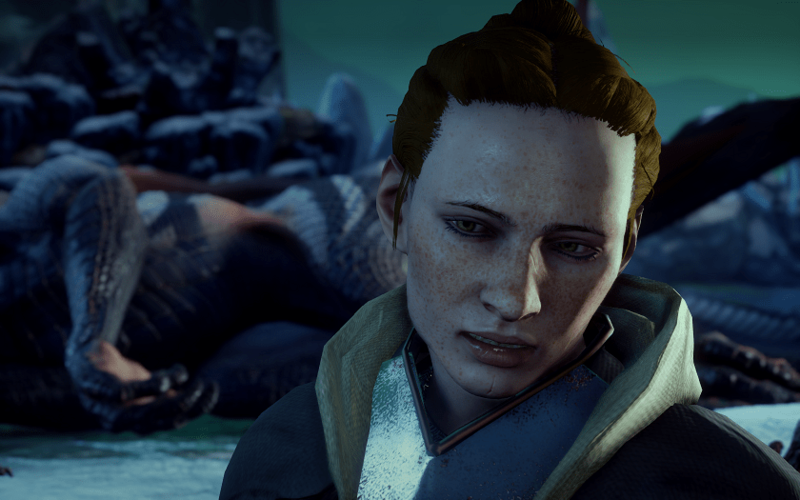 Once again, I am happy that I chose an elf to be my Inquisitor in this game, but disappointed, that that was not the only option. The game continues to be focus acutely on elves and their forgotten history, even rewriting it with this discovery about Ameridan, for example, and especially with Solas’ involvement as one of the elves’ gods. I understand that players might not have liked being forced to choose from only one race–a complaint that initially hounded Dragon Age II–but the elf-only option would have allowed the story to delve more deeply into the elves, which is the direction it seems to want to go. Ameridan does’t seem overly upset about the turn of events, nor of his pending mortality now that the magical bindings have been lifted. He is no longer able to contain the demon dragon, but before he goes, he leaves Lerenne his 800 year old Inquisitor robe, and scatters his memories to the winds. I am also left with the uncomfortable realization that I have no more potions left, and am now face-to-face with a very angry dragon. Fortunately, Hakkon Wintersbreath isn’t ready to fight yet either, and after making a good show of it, flies off. I restocked my precious potions and switched out Cassandra for Iron Bull, at the demands of my daughter, then checked in with the Stone-Bear clan to confirm that they were cool with me killing Hakkon, whom they consider a god, just like all the other spirits and demons from the Fade. Svarah Sun-Hair explains that killing the dragon means freeing the spirit so that it can be reborn. This is the Avvar way. The Hakkonite’s plans to bind and use the spirit to their own ends is anathema. But they aren’t going to help with this dragonslaying, of course. That’s my job. First, let’s find Ameridan’s memories (couldn’t he have just kept a diary in his pocket?) This takes us back through all the major points on the map where we found clues to Ameridan’s travels. At the shrine, where we found a figure of Andraste holding elven halla statues, we hear Ameridan’s voice praying to both deities. Every companion has something to say about this, but Cole, unsurprisingly, is the most insightful, both because he is in touch with the Fade, and because he’s so open-minded, while the others are very much bound to their beliefs (although, I love that Cassandra, a devout Andrastian Seeker, starts to warm to Cole, and their shared ambient dialogue is both amusing and touching). In this memory, Cole points out that Ameridan’s prayers to the different gods lead to the same place. To me, this implies a godly connection to the Fade, lending further validity to the Avvar beliefs. At Telana’s grave, Ameridan’s voice instructs her not to return for him, though he knows she will try, but instead to carry his message to their people to encourage them to help the Orlesians. Cole delves into Telana’s memories and reveals that, dying, she waited here for her beloved, trying to reach him through the Fade, clinging to him through dreams until she breathed her last. Once all the memories are collected and the map quests complete, I head off to fight Hakkon Wintersbreath. This is another challenging, but not overly difficult battle. Dorian died a few times, mainly because he didn’t think it necessary to clear out when the dragon was coming in for a landing. Hakkon kept spouting nonsense about taking over the world or something, but as his health bar dwindled, he conceded that I was a worthy opponent. Once defeated, Scout Harding comes back to express her thoughts on the entire event. I loved the opportunity to spend so much time with one of my favourite non-playable characters, though I was disappointed that she didn’t actually fight at my side, even though her words and presence implies that she did. Hakkon Wintersbreath’s death leaves behind more sweet loot, and we get to watch as the spirit that had been bound to the dragon rises majestically into the air and returns to the Fade. Back at Stone-Bear Hold, Lerenne is welcomed as kin and given the name First-Thaw. She is also asked to cast judgment upon Storvacker, who, by clan standards, ought to have fought to the death rather than allowed herself to be captured by the Hakkonites. I decide to accept Storvacker as the newest Inquisition Agent. 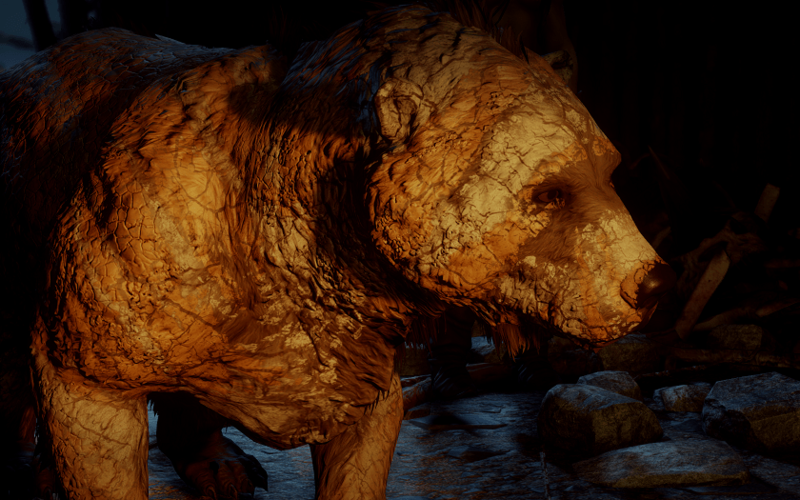 The bear, along with Sigrid the spirit-possessed mage I hired earlier, end up causing quite a stir. Cullen is none too pleased with these decisions, but is a good, obedient soldier and does as I command anyway. Grudgingly. All in all, a solid piece of downloadable content, and one that actually does what it’s supposed to, which is enhance the main game, rather than feel like it should have been part of the main story. One of my complaints with DLC in previous BioWare games was that the story presented in the DLC featured major events that had too many ramifications to simply be considered optional gameplay. The Jaws of Hakkon is a self contained story that relies on the main foundations of the game, but is not needed to understand or appreciate the latter. I am still waiting for my Grey Warden plus Hawke team up DLC though. And it better damn well have griffons. I think Storvacker was responsible for the most hilarious moments of this DLC… first with her Mean Girls inspired codex entry, and then with all the awful bear puns you can make during her judgment. I loved it. Thank you, Storvacker. I agree with your assessment, a solid piece of DLC. I just hope there is more soon!